BAE Systems is working on a super gel that hardens on impact to protect soldiers in battle. Nicknamed ‘bullet proof custard’ BAE Systems is adding a top-secret liquid to revolutionise body armour used by soldiers that absorbs the force of a bullet shot by thickening and hardening instantly on impact. 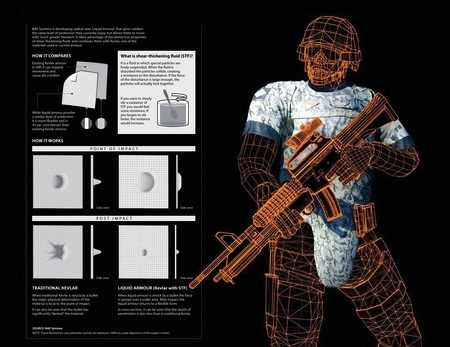 The bulletproof armour made from ‘shear-thickening fluids’ will be nearly near half as heavy as traditional ceramic panel armour, giving soldiers lighter, more flexible, and even greater manoeuvrability on the battlefield. Scientists from BAE Systems developed the high-tech ‘liquid armour’ by inserting the futuristic formula between layers of traditional Kevlar (a synthetic fibre with high tensile strength and temperate resistance). When a bullet hits the armour, the fluid solidifies and absorbs the impact over a wider area compared to a traditional vest, not only protecting the soldier, but also reducing any immediate impact pain.In addition to increasing the ballistic performance of combat body armour, the technology could also be used by police forces and ambulance crews in the future. From BAE Systems; thanks to Winchell Chung.